On Tuesday, a 24-year old Israeli woman died of wounds sustained Monday morning when she was stabbed at Horon settlement. The two Palestinians who were killed immediately following the stabbing on Monday were later identified as Ibrahim Osama Yousef ‘Allan, 23, from Beit ‘Or at-Tihta town, west of Ramallah, and Hussein Mohammad Abu Ghosh, 17, from the Qalandia refugee camp, north of Jerusalem. 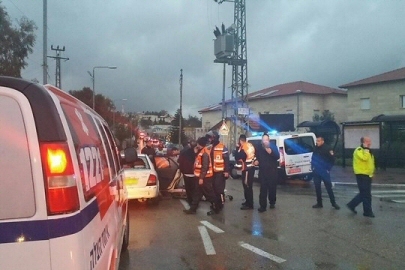 Israeli sources reported that the seriously wounded Israeli woman, identified as Shlomit Krigman, 24, died of her wounds at the Hadassah Israeli medical center, in Jerusalem, on Tuesday morning. The sources added that another Israeli woman suffered moderate wounds in the attack. Following the attack, the army conducted a search of the settlement, close to Route 443, between Jerusalem and Modi’in Israeli colony. Two Palestinians were shot dead, Monday, after allegedly stabbing and injuring two Israeli women in the illegal Israeli settlement of Beit Horon, west of Ramallah, in the central occupied West Bank, Israeli police said. The spokesperson later clarified, according to Ma’an News Agency, that both Palestinians had been shot dead. One Israeli woman, 24, was seriously injured after she was stabbed in the ‘upper part’ of her body, while another woman, 60, sustained light wounds, Samri said. She also said that two explosive devices were also found, after police searched the area.